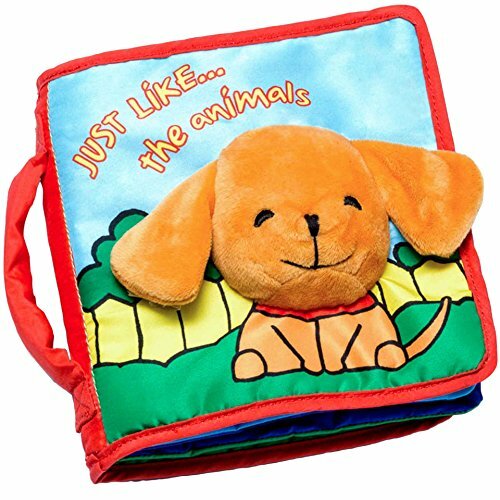 'Just like... the animals' provides endless hours of fun and learning for your little one. Designed by reading development experts, each page of this toddler-approved book features bright colors to hold baby's attention longer and activities to keep little fingers busy. Whether they are tapping a bell, feeling the crinkly leaf, tickling the starfish, or playing peek-a-boo with the bird, our book is both educational and fun! Built to last, our cloth book features strong stitching, a handle for carrying or attaching to a playpen or stroller, and is washable for when it spends a little too much time in baby's mouth. Whether you are ordering for your child or as a gift, 'Just like... the animals' comes packed in a luxury gift box and includes a free eBook about how to read with your baby. Packed with information and tips, this eBook is designed to help you give your child a flying start! We stand behind all of our products and offer a one month 100% money back satisfaction guarantee. If for any reason you are not satisfied with your book, simply send it back for a full refund. If anything happens after the guarantee period, contact us so we can resolve the situation to your satisfaction. Click Add to Cart while supplies last and see your child develop the joy of reading! ToBeReadyforLife believes in paying it forward. So we donate a part of all proceeds to charity to help provide life changing adventures for children battling cancer. When you purchase from us, not only are you getting a quality product, but you are helping to improve the life of a child in need. THE PERFECT GIFT FOR BOY & GIRL: Packed in a luxury gift box, 'Just like... the animals' makes the perfect present for Easter, a baby shower or birthday. Once children have a love for reading, it is a lifetime gift! We donate to children's charity, so by purchasing our soft cover books, not only are you getting an amazing product, but you are also helping to improve the life of another child. 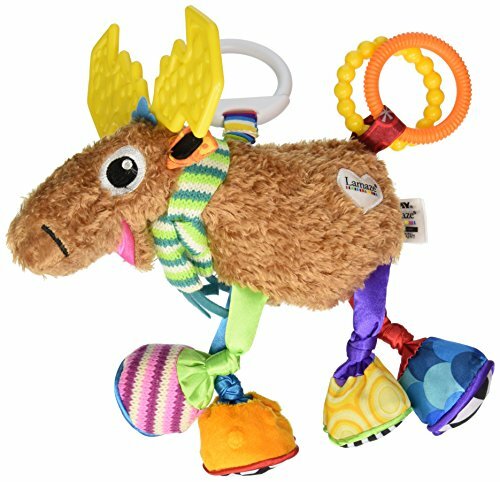 The Lamaze link on his back makes it easy to take baby's favorite moose along, and you can hang the toy over a crib, car seat, or play mat. Your baby can enjoy the squeaks, rattles, and crunches anywhere you go. This well-built moose will stand up to the most enthusiastic play. Mortimer measures 11.5 x 5.3 x 2.8 (LxHxW) inches and comes with a 90-day limited warranty. Lamaze offers developmental toys that engage children, and provide parents with peace of mind, knowing their children are being inspired and enlightened by safe and high-quality playthings. Lamaze created the Infant Development System working in tandem with childhood developmental experts. Lamaze ensures your baby will grow, discover, and learn with the right toy at the right time. Mortimer is made of super soft material that baby will love to touch and snuggle. Chase is on the case! 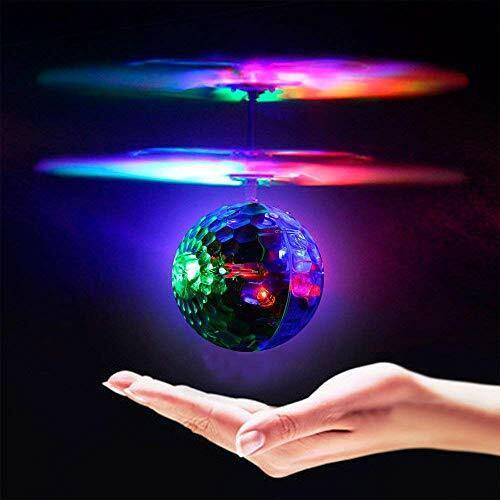 Fly to an Ultimate Rescue with Chase s Ultimate Mini Helicopter! Featuring real working wheels, a flip-down rescue hook and a rotating propeller and realistic detailing, this helicopter brings the action-packed world of Adventure Bay to life! 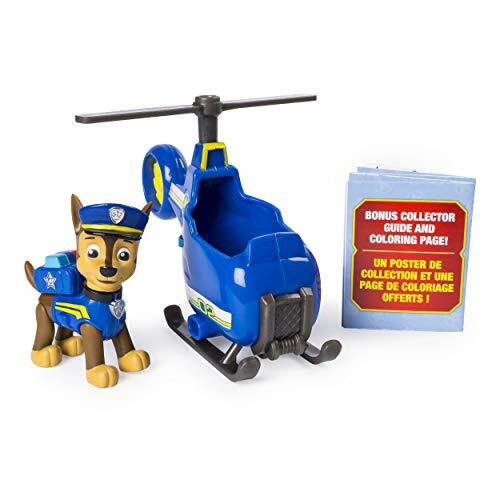 With Chase (figure included) in the cockpit, your child can use their imagination to create all kinds of Ultimate Rescue Missions for this daring pup. For even more exciting missions, combine and play with any of the PAW Patrol Ultimate Rescue Vehicles! The Mini Helicopter easily attaches to the side of any Ultimate Rescue Vehicle the PAW Patrol is on a roll! When your child completes their mission, they can get creative using the bonus collector guide and coloring page! For hours of Ultimate Rescue play, lift off with Chase s Ultimate Mini Helicopter! Ultimate rescue Helicopter: Chase's ultimate rescue mini helicopter is ready for a ruff, ruff, rescue! Put Chase (figure included) behind the wheel and race to save the day! Chase's ultimate mini helicopter is a great gift for kids aged 3+. Collect all of the paw patrol's ultimate rescue vehicles and go on an epic ultimate rescue mission! 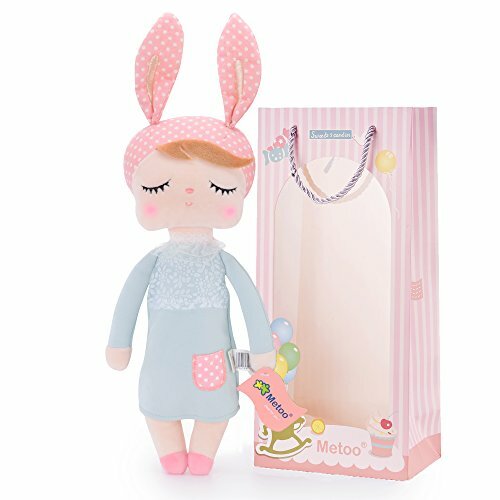 Metoo Angela Sleeping Bunny Rabbit Girl Pink Ear Wear Gray Dress Stuffed Plush Baby Dolls Toys Specification: Made of high quality safety environmental fabric: cotton cloth+PP cotton filler.Could be wash. Size: 12*4inch/30*10cm in Heigh*width. Weight: appox 0.18kg Package included 1*metoo bunny girl doll+ 1*original paper gift bag. Every seam is tight and well stitched as picture show. Adorable bunny long ear could be curved. Sleeping bunny girl looks so happy,we could not stop looking at her. Super soft fabric,perfect size and weight for your baby snuggle her in arm and play for all day. Sweet gift for Easter day decor,children's birthday,christmas,thanksgiving,mother's day and other memorial day. Collectible dolls for toys collector. It is a collectible stuffed girl's dolls, each series have different story, and you can find the whole set collection in our shop. More popular Metoo dolls include: Tiramitu bunny, Thumb bunny, Angela girl, Dreamy girl, Farm friends, Lover bunny, Wedding bunny etc. Package 1 pcs paper gift bag fit for this cuddly bunny doll. Item stays in a smoke-free, pet-free environment. 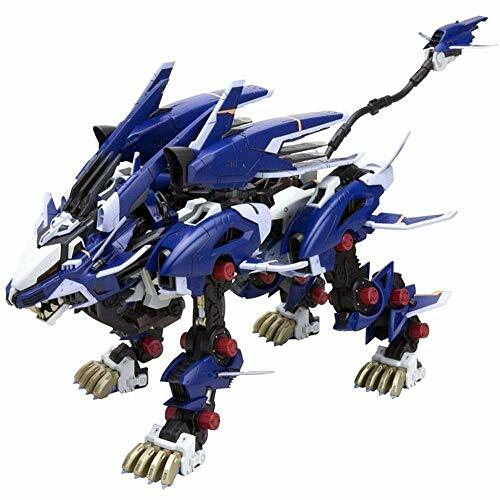 Commitment: All items are brand new as the picture, if for any reason you are not happy with any product from our store, please do not hesitate to contact us,we will try our best to resolve it. We take full responsibility for the quality of our products.Any question,please feel free to contact us. Babies will love this big set of squeezable, teeth able, baby basics. 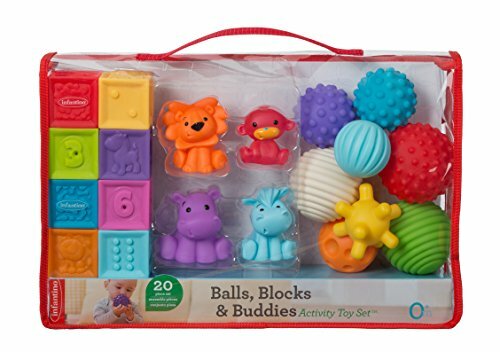 These textured blocks, balls, and animal pals introduce numbers, colors, and animals with lots of open-play potential. Includes 8 easy-to-grab textures balls, 8 counting blocks, and 4 squeezable animals. 20 pieces in all. 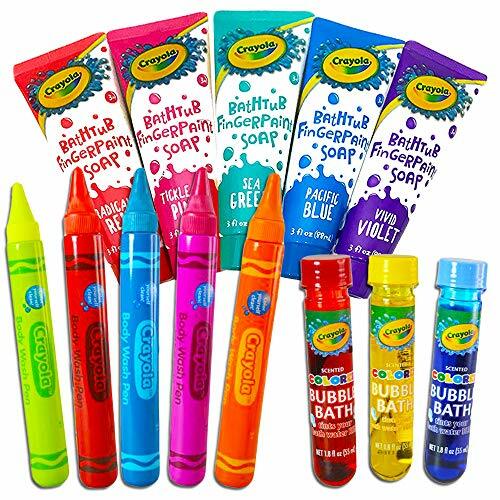 Crayola Bath Super Set -- 5 Crayola Bathtub Fingerpaint Soap Tubes, 5 Body Wash Pens, 3 Bath Fizzie Bombs (13 Pc Set). Includes 3 jumbo Crayola Color Twist Bath Fizzies. Each Crayola bath bomb changes color 3 times! Includes 5 Crayola fingerpaint soap tubes (green, blue, red, pink, purple). Each tube is 3 oz. Includes 5 Crayola bath pens (green, red, blue, pink, and orange). Each body wash pen is 1.9 oz. This Crayola bath super set has everything you need to make bath time a blast. Crayola Bath Super Set -- 5 Crayola Bathtub Fingerpaint Soap Tubes, 5 Body Wash Pens, 3 Bath Fizzie Bombs (13 Pc Set). Includes 3 jumbo Crayola Color Twist Bath Fizzies. Each Crayola bath bomb changes color 3 times! Includes 5 Crayola fingerpaint soap tubes (green, blue, red, pink, purple). Each tube is 3 oz. Includes 5 Crayola bath pens (green, red, blue, pink, and orange). Each body wash pen is 1.9 oz. This Crayola bath super set has everything you need to make bath time a blast. Add a smile to your Easter baskets! 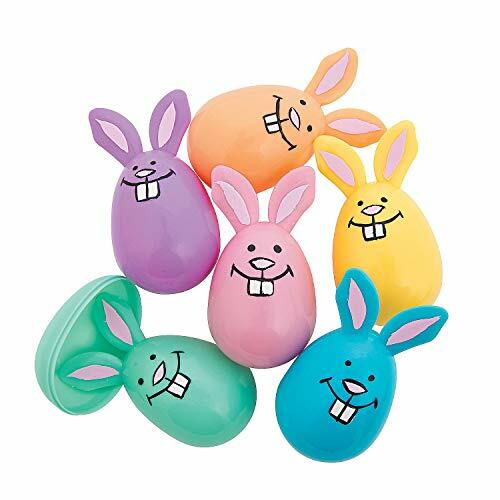 Fill these plastic bunny-shaped eggs with candy, small toys or some coins! Perfect for Easter egg hunts, these bunny-shaped eggs are sure to impress on Easter Sunday! Plastic. 3 1/2"
Add a smile to your Easter baskets! Fill these plastic bunny-shaped eggs with candy, small toys or some coins! Perfect for Easter egg hunts, these bunny-shaped eggs are sure to impress on Easter Sunday! PLUSH BOWLING SET: The Melissa & Doug Bowling Friends Preschool Playset features 6 animal bowling pins and a 4-inch indented bowling ball, along with a zippered carry case for easy storage and portability. 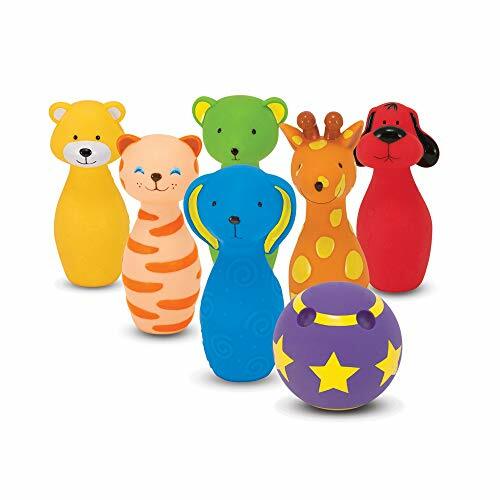 WEIGHTED BOTTOMS: This soft bowling set for kids is easy for children to set up and play with, thanks to the weighted bottoms in each bowling pin. EASY TO STORE: Our bowling game set for kids can be easily stored in the included zippered carrying case. This fun bowling game also helps kids develop gross motor skills, balance, and hand-eye coordination. GIFT FOR AGES 2 TO 4: This play set makes an exceptional gift for kids from 2 to 4 years. Add the Melissa & Doug Catch & Count Fishing Game to round out the hands-on play experience and give kids another engaging option for screen-free fun. Playtime with miles of learning! Park, play and explore on three stories of interactive learning fun with Tommy and his tow truck at the Go! Go! 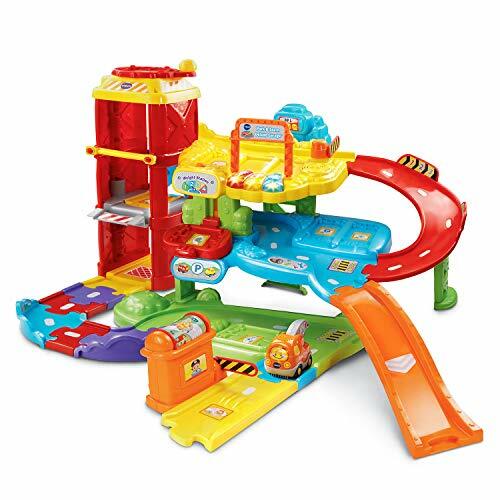 Smart Wheels Park and Learn Deluxe Garage by VTech. Learn about colors, the rules of the road and play fun sing-along songs and melodies by pressing the three light-up buttons. Roll the SmartPoint tow truck over nine SmartPoint locations to hear different phrases, music or fun sound effects. Press the toy tow truck s light-up button to hear three sing-along songs and learn the letter T and the name of the vehicle. Build motor skills by placing the tow truck in the elevator and turning the helicopter pad to raise the elevator to any floor on the toy garage. The elevator recognizes each floor with fun sounds and phrases. 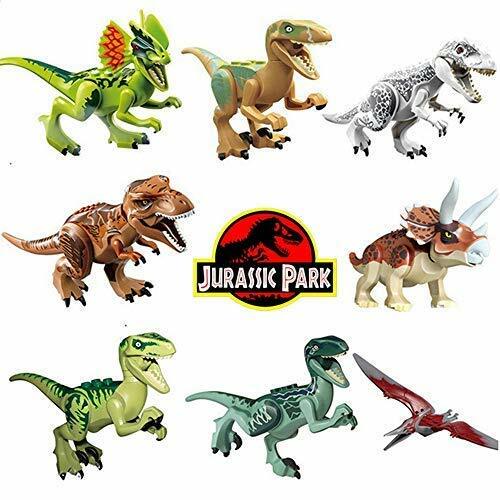 Use the seven included track pieces to connect to other Go! Go! Smart Wheels and Go! Go! Smart Animals playsets (each sold separately) to encourage creativity. Features durable design, automatic shut-off and volume control. Playset requires 2 AA batteries (not included). Tow Truck requires 2 AAA batteries (batteries included for demo purposes only; new batteries recommended for regular use). Assembly required. Intended for ages 1 to 5 years. I Hereby Crown You Big Sister! 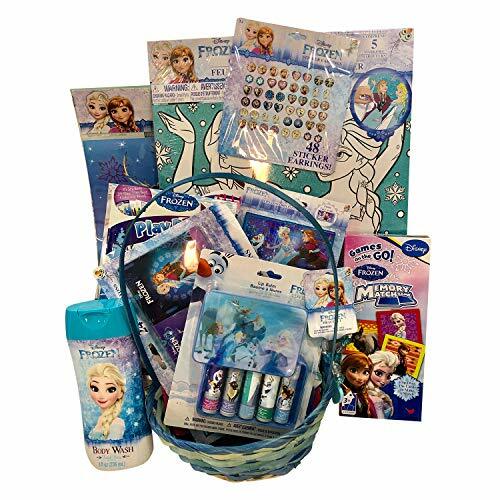 This 3 piece Big Sister gift set is the perfect way to make big sisters feel special. 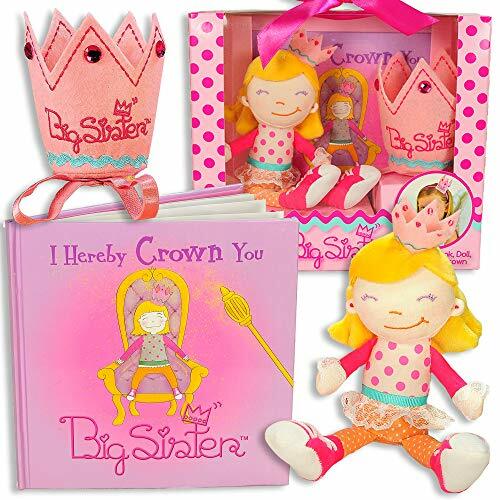 The gift set includes a storybook, a big sister doll, and a child size big sister crown. The book begins with mom (the queen) "crowning" the new big sister. It is a sweet story with engaging artwork explaining why it is great being a big sister. The book lays the foundation for a new arrival and the responsibilities of a new baby in the house. The gift set includes an 8" doll that is the "big sister" in the book. She is wearing a crown that matches the child size crown. The crown measures 3.5" tall and tapers down from 3.5" wide to 2" at the base. It comes with an elastic headband and is worn on top of the head slightly to the side. It is made of high quality felt with Big Sister embroidered on the front and is complete with ric rac detail and pink jewels. The gift box is fun and bright pink with polka dots and a pink satin ribbon. Perfect gift for little girls and toddlers for an incredible best big sister experience! Big Sister Gift - 3 Piece gift set is a creative, unique, and fun way to make big sisters feel special. The set includes a story book about being "crowned" a big sister, a child sized crown, and a big sister doll with matching crown. I Hereby Crown You big Sister is a delightful story book illustrated by Ana Santos explaining all the special aspects of a new baby and the role of a big sister. Book measures 7. 5 x 7. 5 and has 24 watercolor illustrated pages. Big Sister Doll wearing crown is an 8 soft doll and is the main character in the book. The doll comes with precious embroidered details, a crown, and her signature outfit of bright fun colors complete with ribbon and lace and of course her favorite high top tennis shoes. Felt embroidered crown is a child size crown that is worn slightly to the side just like the character. It is made of felt and has Big Sister embroidered on the front and includes ric rac detail and pink jewels. The crown measures 3.5 tall and tapers down from 3.5 wide to 2 at the base. Watch baby s delight as Jacque the Peacock spreads his feature-filled feathers. This colorful peacock helps baby through first vital stages of sensory development. Jacque s four brightly colored feathers stimulate baby s vision, each with a different design. Baby will want to touch, grip and grab the multi-texture soft-touch velour body and crinkle feathers. When shaken, Jacque will surprise baby with a rattle sound. Baby can also find a self-discovery mirror, helping baby to learn how to focus. 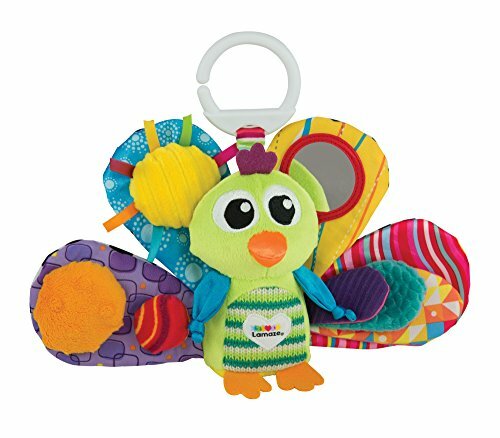 The Lamaze clip lets you hook Jacque to strollers, carriers and diaper bags to take him along for on-the-go fun. Tomy offers developmental toys that engage children, and provide parents with peace of mind, knowing their children are being inspired and enlightened by safe and high-quality playthings. Tomy created the Lamaze Infant Development System working in tandem with parents, babies, and childhood experts. Lamaze ensures your baby will grow, discover, and learn with the right toy at the right time. ON THE FLY FUN: Watch your little one be inspired by each of Jacque the Peacock's 4 fun-filled feathers. FOCUS FEATHERS: Jacque helps stimulate your kiddo's eyes with 4 feathers decorated in captivating colors, playful patterns, and even a self-discovery mirror. DISCOVERY LINKS: Jacque the Peacock comes with 10 colorful on-the-go links for even more fun. SNUGGLE THAT BIRD: A soft body to hug, crinkly feathers to squeeze, a rattle to shake and a clip to make car rides fun. BABY LOVED, SCIENCE PROVEN: Designed to help baby develop visual, auditory, tactile and fine motor skills. 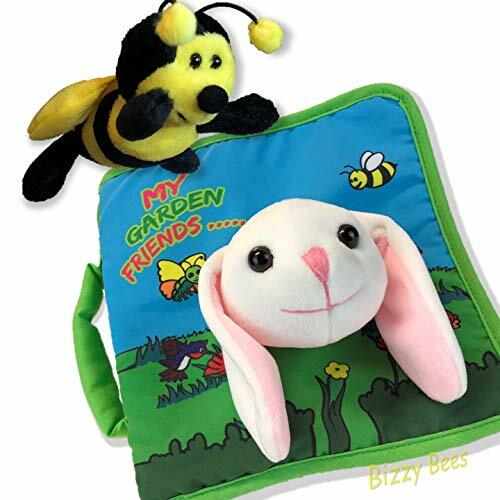 Create a learning and sensory adventure that will completely captivate your little one with this combination BUNNY CLOTH SOFT BOOK and 5 inch PLUSH STUFFED BEE. Each turn of the bright, soft pages will bring a new, exciting, engaging and stimulating experience for your little one through a sensory garden of learning and exploration, all while cuddling your adorable 5 inch plush bee. Your plush bee has a built in loop to make it easily attachable to anything you'd like so you can take it everywhere. Your soft book and plush bunny were created by top selling AMAZON'S CHOICE children's book author Lance Douglas whose captivating books have entertained the world. A squeak bunny hops through the garden. A bee buzzes on a flower. A ladybug is hiding under a crinkle leaf. Your fingers become the wiggly legs of a caterpillar. Turn the page and the caterpillar has transformed into a butterfly. A hummingbird sips nectar from a flower and the strawberries are ready to be picked. Each page of this bright and cheerful soft book and the comfort of the plush bee will bring joy and happiness to you and your special little one. Get your Garden Friends soft book and your plush bee today for your child, or as a special gift. You will be so happy that you did.! 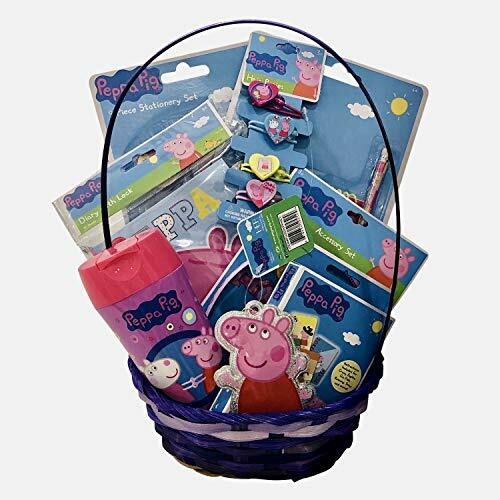 Perfect gift basket for Baby/Toddler Girls Birthday, Easter, Get Well etc. If you can dream it, you can build it with Rusty Rivets! 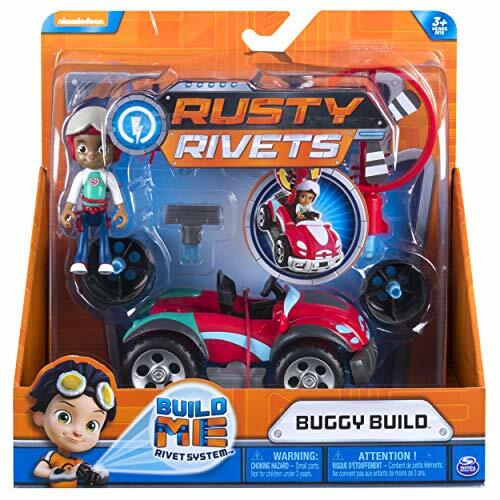 The Rusty Rivets Build Me Rivet System allows kids to design, build, and create just like their favorite characters. The Buggy Build set includes everything needed to build Ruby s iconic buggy. 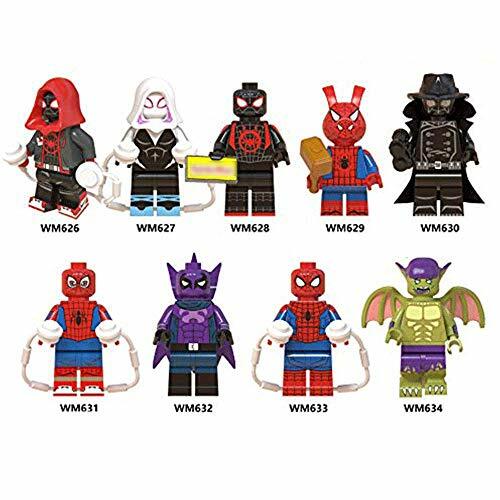 Collect all of the Build Me Rivet System sets to build all of Rusty s creations from the show. Combine it and design it with Rusty Rivets! Easy build designs make it simple for kids to combine it and design it just like Ruby! Includes a Ruby figure to get in the driver's seat and hit the road. Watch how the clear chassis shows the real working gears power up the spinning fan accessory. The Rusty Rivets Build Me Rivet System is for ages 3+. No batteries required. Exploring Taggies textured tags can provide tactile stimulation that babies crave for development and have an amazing calming effect on little ones. Taggies Signature Collection is recognized as the premium line of wonderfully soft and soothing Taggies toys made by Mary Meyer. 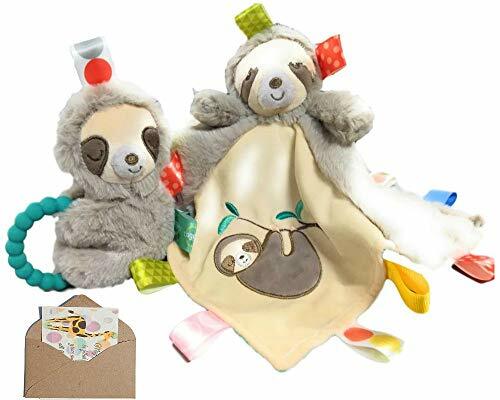 STIMULATING TAGGIES- The adorable sloth character blanket and rattle/teether will delight both babies and new moms. Molasses has a sweet smile and embroidered eyes. The blanket is neutral colors so it's a perfect gift for a boy or a girl. There are ribbon tags sewn all around for sensory play and stimulation. The rattle has a silicone handle that is perfect when the teething begins. PERFECT SIZE-The rattle is 5 inches with a gentle sound. Rattle is so soft that it will never hurt your baby when they start shaking it like crazy. Blanket measures 13x13 so it's perfect for traveling in the car, stroller or bedtime. SOFT AND CUDDLY- Fuzzy pile is so soft that baby won't want anything else for a security blanket. The back of the blanket is a shiny aqua satin. EASY TO CLEAN-The blanket is machine washable in cold water. Air dry. The rattle/teether should be surfaced wash as needed and air dried. 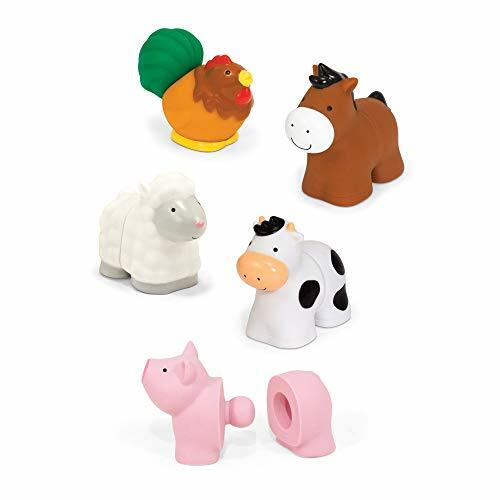 MARY MEYER- High quality and safe toys with a name you can trust for over 80 years. 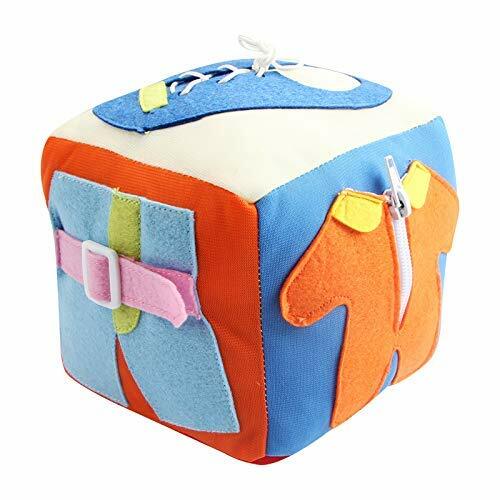 The Activity Learning Cubic Toy is uniquely designed with colorful primary bold colors to appeal to any child's early fascination with buckles,zippers, latches and buttons. Toddlers will not only learn to SNAP and CLICK but also develop and strengthen fine motor skills, hand eye coordination, problem solving, and color recognition. 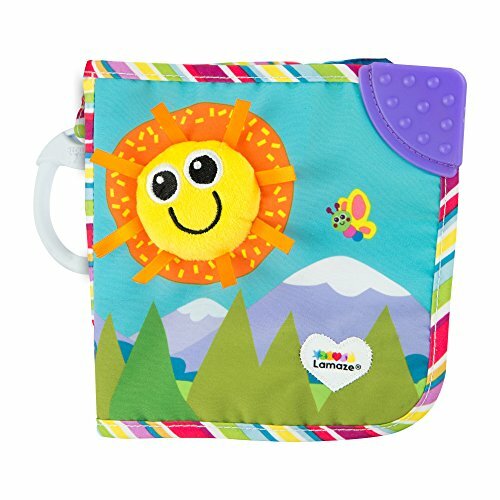 The cuddly body is decorated with fun shapes, numbers and surprises to keep kids learning and entertained. 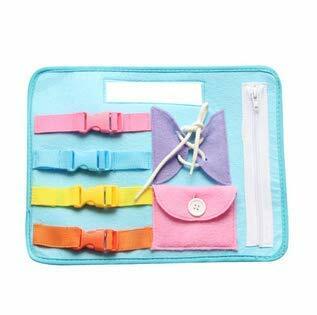 There is also an easy-glide zipper with pocket to hide hidden treasures. It help kids learn and entertain them too. Whether it s counting to improve math skills, naming the beach embroidery, zipping up and down, or snapping buckles there is plenty for kids to learn while on the go.Baby can play this toy in the car, train, airplane, grocery store, and doctor waiting rooms. It is perfect for improving motor skills for special needs, autistic, and disabled children. Surface washable,it's lightweight and easy to hold for baby's little finger.